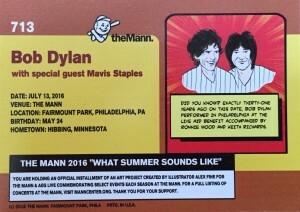 The between-song banter by Mavis Staples – who is opening for Bob Dylan on his summer tour – Wednesday night at the Mann Center for the Performing Arts in Philadelphia included an interesting and somewhat unexpected observation. 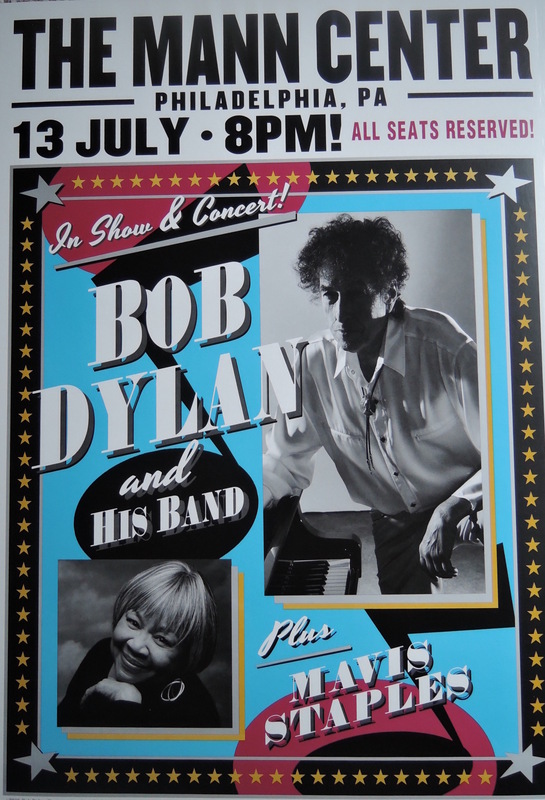 “Does Bob move with a swagger?” I asked my friend Ted, who has seen Dylan approximately 25 times in concert and had driven all the way from Illinois (919 miles and 14-and-a-half hours in what has been dubbed the 2016 Iron Undershorts Tour) to accompany me to my first Dylan concert. “He’s more of a prancer,” said Ted. Since my preconceived notion of my inaugural Dylan concert didn’t include experiencing much singing or prancing, the evening was shaping up to have potential if either of those things happened. Ted and I have been talking for years about going to a Dylan concert. He is a big fan. Me, not so much. I like some of Dylan’s hits – “Blowin’ in the Wind,” “Like a Rolling Stone,” “Lay Lady Lay,” “Knockin’ on Heaven’s Door” – but I don’t really know much more of his vast catalog. And I understand his music speaks to generations of fans. It just doesn’t speak to me in the same way, which is OK. Music is a subjective experience and we all have our favorites. Bob Dylan from afar, at the Mann Center for the Performing Arts in Philadelphia July 13, 2016. But I thought it was important to see a significant artist like Bob Dylan in concert at least once. He’s 75 years old now, and I’m not getting any younger. And having Ted along to essentially identify the songs on the setlist and translate Bob’s lyrics to some of those songs was a wise decision. 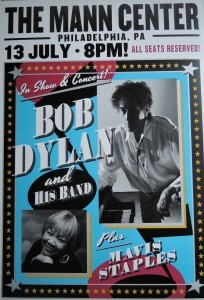 So how is Bob Dylan in concert for someone who has never seen Bob Dylan in concert? Well, it’s Bob being Bob. Maybe my expectations were too low from the get-go, but Bob’s voice was better than I expected. 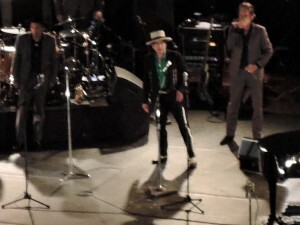 The show featured Bob doing a handful of Frank Sinatra songs that Dylan covered in his 2015 “Shadows in the Night” album. Those songs required Bob to become a crooner and do all the heavy lifting on the vocals. In fact, none of his band members had microphones and thus didn’t provide any backing vocals for any song during the show. And the crowd reacted favorably to those tunes. 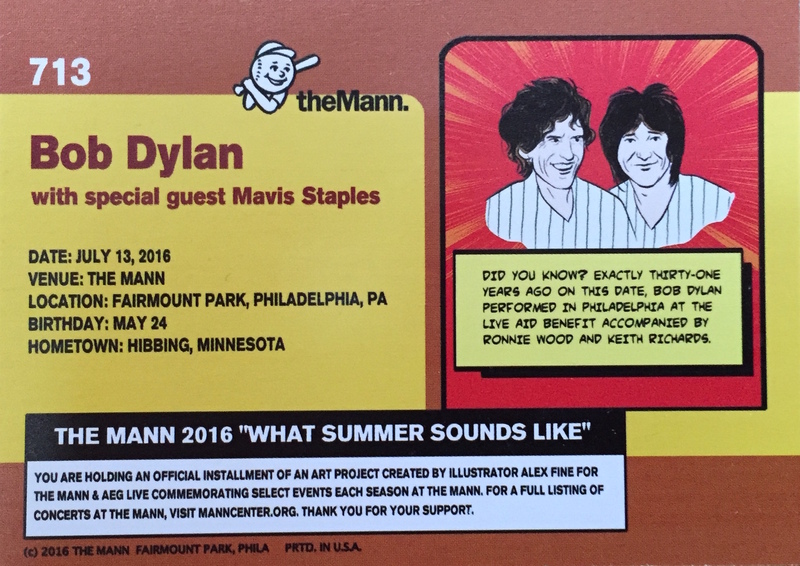 For a guy who can’t sing, Dylan sure did a lot of singing while he was in Philadelphia July 13. Full Moon and Empty Arms (Sinatra cover). How Deep is the Ocean? (How High Is the Sky?) (Paul Whitman & His Orchestra cover). Why Try to Change Me Now (Cy Coleman cover). I Could Have Told You (Sinatra cover). All of Nothing at All (Sinatra cover). Autumn Leaves (Yves Montand cover). (19) Blowin’ in the Wind. (20) Stay With Me (Sinatra cover). The Bob Dylan baseball card, given out after the show. As for whether Bob has a swagger or is a prancer, that seems to be a matter of interpretation. For this show, he did have what I’d call a little bounce in his step, although I’m not sure it rises to the level of prancing. It might be a lilt, or a sway, or even a shuffle. Whatever one’s perception, it appears to be typically Bob-esque. My only complaint is that it was the worst lit concert that I have ever seen, and that was obviously done on purpose. Bob was lit exclusively from the back and sides, with no front lighting. Add in Bob’s wide-brimmed hat and the fact that there were no big screens for this show and it was virtually impossible to see his face, certainly from anything beyond the first few rows or so. Ultimately, though, it was a good concert experience and I’m glad I got to see Dylan. Would I see him again? If I could afford the good seats down front and was allowed to take a few pictures, most certainly. And sure, I’d like to interview him, but my sense is that Bob doesn’t even talk to himself. There was even a nice surprise after the show. As we were exiting the venue, we were handed a Bob Dylan baseball card as a memento of the concert. 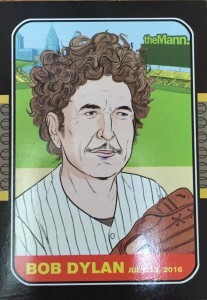 You read that correctly: a Dylan baseball card. It appears that the card is exclusive to the Mann Center for the Performing Arts. The front shows an artist’s drawing of Bob in a pinstriped baseball jersey sans logo, and wearing a left-handed ballglove with the Philadelphia skyline and a sign that reads “the Mann” in the background. The back of the Bob Dylan baseball card. As a longtime baseball card collector, it’s a pretty cool collectible from my first Bob Dylan concert. It almost made me want to prance a little on the way to the car.